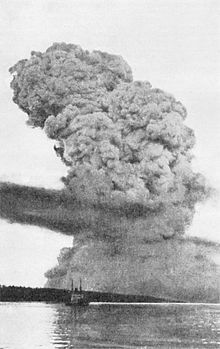 The Halifax Explosion wis a maritime disaster in Halifax, Nova Scotia, Canadae, on the morning o 6 December 1917. SS Mont-Blanc, a French cargo ship laden wi heich explosives, collidit wi the Norse veshel SS Imo in the Narraes, a strait connectin the upper Halifax Harbour tae Bedford Basin. A fire on buird the French ship ignitit her cargo, causin a lairge explosion that devastatit the Richmond destrict o Halifax. Approximately 2,000 fowk war killed bi blast, debris, fires or collapsed biggins, an an estimated 9,000 ithers war injured. This page wis last eeditit on 4 November 2017, at 20:13.